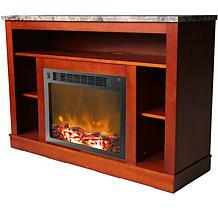 Functionality and elegance come together with this NORTHWEST Electric Fireplace! 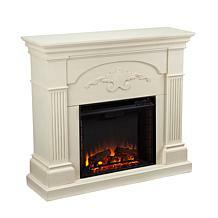 Bring the beauty and warmth of a wall mount remote controlled electronic fireplace to your living space with this stunning Northwest 36" Color Changing White Fireplace with 3 backgrounds and energy-saving LED light flames. Stay cozy and warm while enjoying a beautiful fire without the dangers of a real fireplace, instantly transforming your living room into a lap of luxury just with a touch of button. 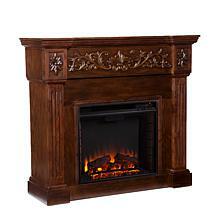 ADJUSTABLE FLAME BRIGHTNESS & COLORS: Amaze your guests with the realistic-looking flames of this electric fireplace. Features 3 different media backgrounds of log, pebbles and crystals with 10 different color options allowing you to customize and instantly change the ambiance in the room. TWO HEAT OPTIONS, ENERGY-SAVING LED & TIMER: Features two heat settings (low 750W and high 1500W) that can heat any room of up to 400 feet (20x20 ft room). Save on natural gas and heating oil costs, as this fireplace uses LED technology that requires less energy to heat a room. A built-in timer for auto-shutoff can be set for 30 minutes to 7.5 hours. HASSLE-FREE INSTALLATION & USE: Comes with mounting hardware and uses simple installation with the step-by-step instructions provided. The remote control has on/off switch, heat, flame brightness and dimmer settings. ELEGANT HOME DCOR: Fill a blank wall with a touch of modernity and elegance. 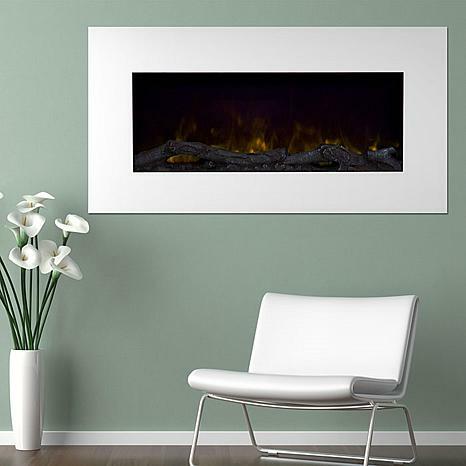 This electric fireplace encased in durable tempered glass with a contemporary white frame will serve as functional decor for your bedroom, library, or family room. It can be used at any time of the year with its dual-mode feature that allows the fireplace to operate with or without heat. 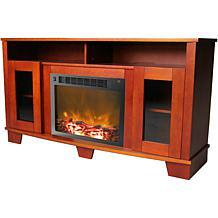 Product Dimensions: Length: 35.4 in., Width: 3.7 in., Height: 22.0 in.